China's fixed investment growth, though still quite strong, is beginning to moderate. This is another sign that the Chinese authorities are steering this massive boat in a somewhat different direction. They certainly have the resources to keep the same pace of fixed investments, but for various reasons are choosing a more moderate approach. These reasons include inflation risk and quality/sustainability of the GDP growth. 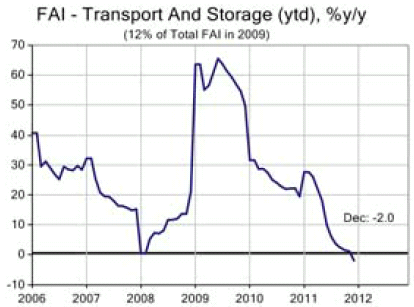 Some of this moderation is coming from slowing investments in transport and storage. Environmental projects investment growth is slowing down as well. Growth in real estate and manufacturing projects remains steady. It is important to note however that these growth numbers are materially overstating the actual capital investment. ISI Group: The FAI data are highly flawed because they combine asset sales and real capital formation – two very different concepts. FAI is not capital formation, in contrast to what many investors imagine. 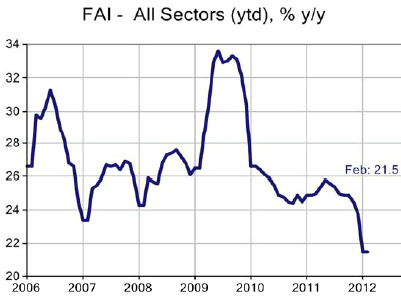 FAI overstates capital formation in China by a wide margin (about 40%). But the trends are quite clear.